Salling, John B. (1847-1959). Private Co.D, 25th Va.Inf. and 2nd to last surviving WBTS Veteran (VA). 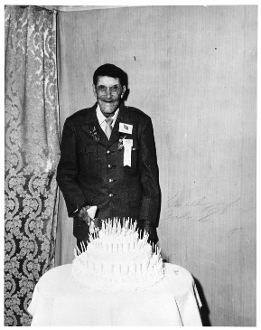 Large (8 X 10") glossy photo of Salling wearing various UCV reunion medals, standing behind table with his 109th birthday cake having a myriad of candles. Inscribed and signed frontis in blue ink (some fading) plus large inscription (including age) and signature in red ink verso. This inscription XF. Photo probably from home in Slant, VA. VF-XF. Great UCV item.